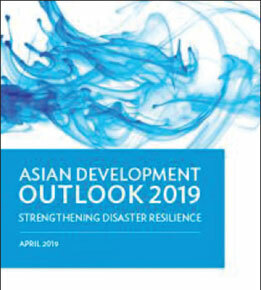 Growth in developing Asia is projected to soften to 5.7% in 2019 and 5.6% in 2020, according to Asian Development Bank Outlook report. Excluding Asia’s high-income newly industrialized economies, growth is expected to slip from 6.4% in 2018 to 6.2% in 2019 and 6.1% in 2020. A drawn-out or deteriorating trade conflict between the People’s Republic of China and the United States could undermine investment and growth in developing Asia. With various uncertainties stemming from US fiscal policy and a possible disorderly Brexit, growth in the advanced economies could turn out slower than expected, undermining the outlook for the People’s Republic of China and other economies in the region. Though abrupt increases in US interest rates appear to have ceased for the time being, policy makers must remain vigilant in these uncertain times. Despite rising headwinds, the region’s growth in aggregate gross domestic product (GDP) slowed only slightly from 6.2% in 2017 to 5.9% in 2018. Excluding the high-income newly industrialized economies, growth was 6.4%. Despite rising headwinds, the region’s growth in aggregate gross domestic product (GDP) slowed only slightly from 6.2% in 2017 to 5.9% in 2018. Excluding the high-income newly industrialized economies, growth was 6.4%. Despite rising headwinds, growth in aggregate gross domestic product (GDP) slowed only slightly from 6.2% in 2017 to 5.9% in 2018 as global trade and economic activity decelerated at the end of the year, affecting many economies in the region. With growth in the People’s Republic of China (PRC) continuing to moderate, regional growth will soften further to 5.7% in 2019 and to 5.6% in 2020. Excluding the newly industrialized economies, growth will slow from 6.4% in 2018 to 6.2% in 2019 and to 6.1% in 2020. Aggregate growth in the three major advanced economies—the United States, the euro area, and Japan—slowed from 2.3% in 2017 to 2.2% in 2018. The slowing trend will likely reach 1.9% in 2019 and 1.6% in 2020 under less accommodative fiscal and monetary policies in the US, uncertainty surrounding Brexit in the United Kingdom and the European Union, and the trade conflict between the PRC and US. Growth slowed from 7.2% in fiscal 2017 to 7.0% in 2018, with weaker agricultural output and consumption growth curtailed by higher global oil prices and lower government expenditure. Growth is expected to rebound to 7.2% in 2019 and 7.3% in 2020 as policy rates are cut and farmers receive income support, bolstering domestic demand. Strengthening domestic demand will offset weaker export growth. Strong consumption—spurred by rising incomes, subdued inflation, and robust remittances—should boost economic activity in the sub region. Growth in the Pacific is set to rebound from a meager 0.9% in 2018 to 3.5% in 2019 as liquefied natural gas production in Papua New Guinea, the sub region’s dominant economy, returns to full capacity following the 2018 earthquake. Meanwhile, lower oil prices and slower growth in the Russian Federation will weigh on economies in Central Asia. Growth in the sub region is projected to decelerate to 4.2% in both 2019 and 2020 as slowdowns in Kazakhstan and Turkmenistan more than offset higher growth elsewhere. Jitters over emerging markets sparked by Argentina and Turkey in 2018 caused regional currencies to depreciate against the US dollar, with the Indian rupee, Indonesian rupiah, and Philippine peso most sharply hit. Partly in response, many central banks in the region hiked their policy rates during the year. Then a pause in the tightening of US monetary policy and some dissipation of concern about Asian emerging markets, allowed many regional currencies and equity markets to recover. Capital flows have stabilized. On the heels of rising oil prices and currency depreciation, inflation in developing Asia picked up slightly from 2.2% in 2017 to 2.5% in 2018. Despite the increase, inflation remains well below the 10-year historical average of 3.2% for the region. It is expected to remain subdued in the coming years. With stable commodity prices, headline inflation is forecast unchanged at 2.5% in 2019 and 2020. The primary risks still center on the PRC–US trade conflict. Uncertainty is heightened by protracted negotiations and disagreements, which could curtail investment and growth in the region. A possible upside risk to the outlook is that negotiations readily bring agreement and lower trade barriers. Beyond the trade conflict, growth in the advanced economies and the PRC may slow by more than expected if Brexit is disorderly, for example, or fiscal policy uncertainty persists in the US. On the other hand, the risk from the US abruptly raising the policy rate has subsided compared to 2018 but the risk of financial volatility remains. High reliance on funding denominated in US dollars renders countries vulnerable to changing global financial conditions. An appropriate policy mix and regional policy dialogue can strengthen domestic financial resilience and limit the impact of shocks from external funding conditions. Exchange rate uncertainty may bear on regional financial conditions. The depreciations and heightened exchange rate volatility in 2018 could affect borrowing costs for economies in the region. High reliance on funding denominated in US dollars renders countries vulnerable to changing global financial conditions. Changes to the exchange rate and the sovereign bond spread, a measure of domestic financial conditions, closely correlated in emerging Asia in 2018. As a currency depreciates, the trade channel tends to loosen domestic financial conditions by improving external competitiveness, while the financial channel tends to tighten financial conditions by worsening the economy’s balance sheet. Trade and financial channels both affect domestic financial conditions. Empirical analysis of selected economies in emerging Asia shows that changes in exchange rates affect sovereign credit risk premiums, which can further influence financial conditions through domestic lending rates. Changes to bilateral exchange rates against the US dollar affect financial conditions largely through the financial channel, while movements in nominal effective exchange rates act via the trade channel. However, the relative dominance of these two effects depends on circumstances specific to each economy, so policy prescriptions should be tailored individually. Domestic financial resilience can mitigate adverse external influences. An appropriate policy mix and regional policy dialogue can strengthen domestic financial resilience and limit the impact of shocks from external funding conditions. Ensuring domestic financial stability is a challenge when external funding conditions are unfavorable. Monetary and macro prudential policies need to consider the effects the exchange rate has through both financial and trade channels. More broadly, it is important to cultivate an investor base at home and deepen capital markets in the region, in particular by further developing local currency bond markets. These policies should go hand in hand with strengthened policy dialogue across borders to monitor macro-financial conditions. Further, capital flow management measures must be considered to mitigate disruptive spillover in an increasingly interconnected global financial system. Growth is expected to edge up by 0.1 percentage point, though, from 6.7% in 2018 to 6.8% in 2019 and again to 6.9% in 2020. Sub regional averages in South Asia reflect heavy weighting for India, where growth slipped from 7.2% in 2017 to 7.0% in 2018 as agriculture and government expenditure both experienced slower growth and as global oil prices rose. Growth in India is forecast to pick up a bit to 7.2% in 2019 and 7.3% in 2020 on recovery in agriculture and stronger domestic demand, with reform having strengthened the health of banks and corporations, and as the implementation of a value-added tax makes domestic firms and products more competitive. Most other countries in South Asia are expected to maintain or slightly improve on their high growth rates including Bangladesh, which is expected to achieve 8.0% growth in 2019 and 2020. Pakistan and Sri Lanka, however, are currently reining in fiscal and external imbalances by implementing a broad range of economic reforms. Inflation in South Asia was stable at 3.7% in 2018 with benign food inflation and despite higher global oil prices. Sub regional inflation is expected rise to 4.7% in 2019 and 4.9% in 2020 under pressure from currency depreciation and India’s upward adjustment of some agricultural procurement prices to cover higher input costs. Sub regional growth was marginally lower at 5.1% last year as strong domestic demand countered slowing exports. With weakening global growth, slowing trade, and softer commodity prices, export prospects dim further for these highly trade-engaged economies. Continued strength in domestic demand should nevertheless support growth at 4.9% this year and 5.0% next year. 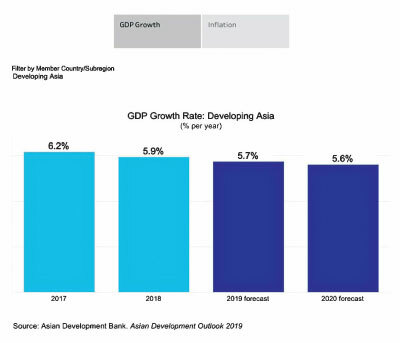 In half of the 10 sub regional economies, growth is forecast to slow this year, while Indonesia and the Lao People’s Democratic Republic will be unchanged, and Brunei Darussalam, Myanmar, and the Philippines will post higher growth. 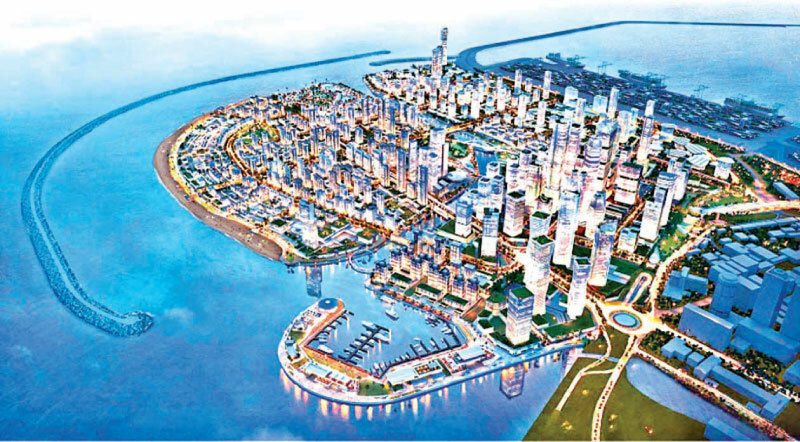 Strong consumption, spurred by rising incomes, stable inflation, and robust remittances is underpinning growth in Indonesia, Malaysia, the Philippines, Singapore, and Thailand, as is foreign investment in Cambodia and Viet Nam, and large infrastructure projects elsewhere. Inflation in the sub region will dip marginally this year before returning to last year’s 2.7%, broadly held in check by slowing growth and lower international oil prices, even as some countries hike administered prices.